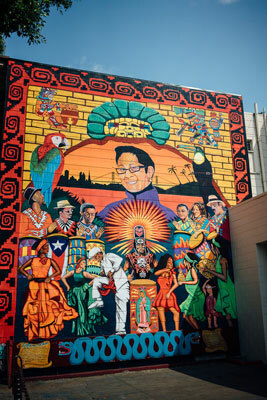 Exploring murals at Mission District in San Francisco! 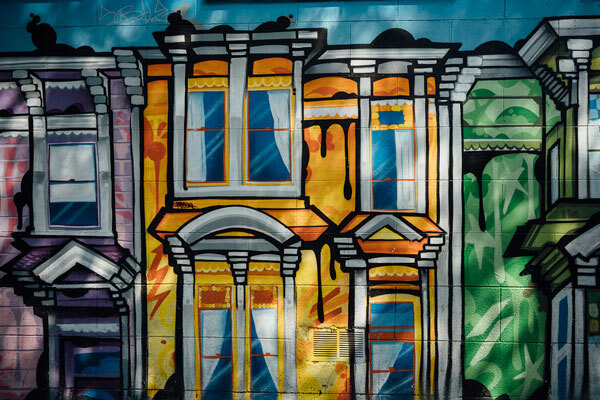 San Francisco, the tiny 49 square miles city, in Northern California, has a treasure trove of murals, thanks to its culture of attracting artists, entrepreneurs and mavericks from all over the world who challenge the status quo. 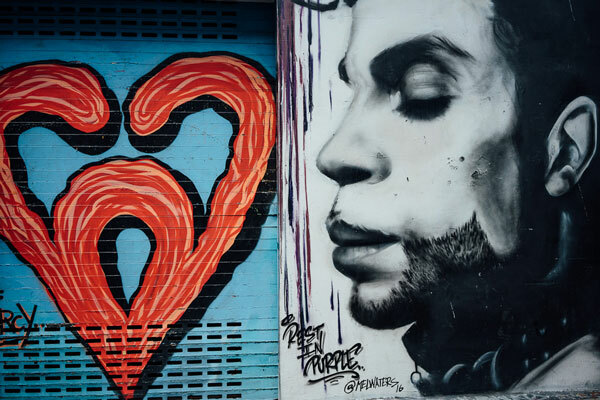 Although the entire city is virtually a canvas for street art, there are certain neighborhoods which will make heads turn for the dazzling array of street art displayed on their walls. 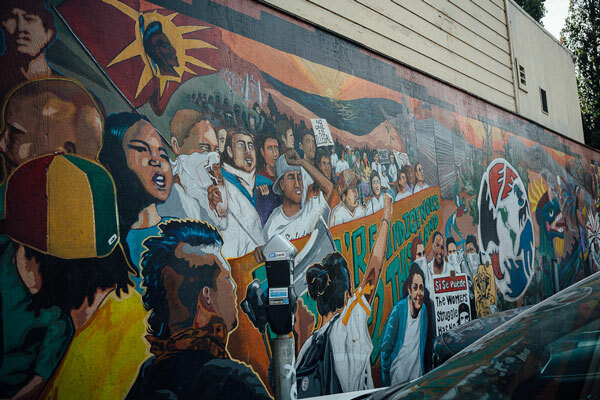 The Mission neighborhood, the largest and trendiest in the city, is known for it’s cultural and culinary diversity as well as it’s murals with strong undercurrents of social justice and Latino identity since this is the last Latino bastion of the city. 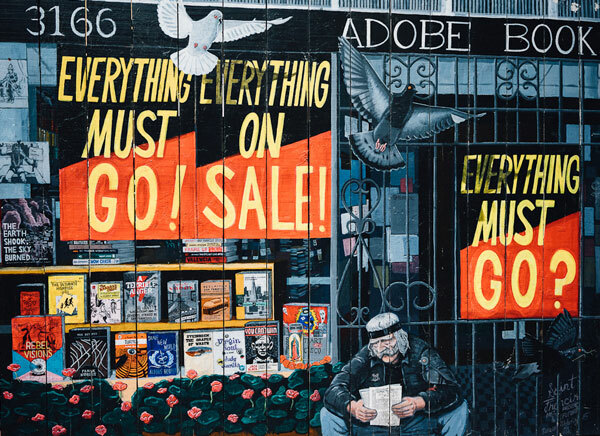 This post is a tour of some of the best murals along 16th and 24th street in the Mission, which are a must visit for art lovers and to get a sense of the true spirit of San Francisco. 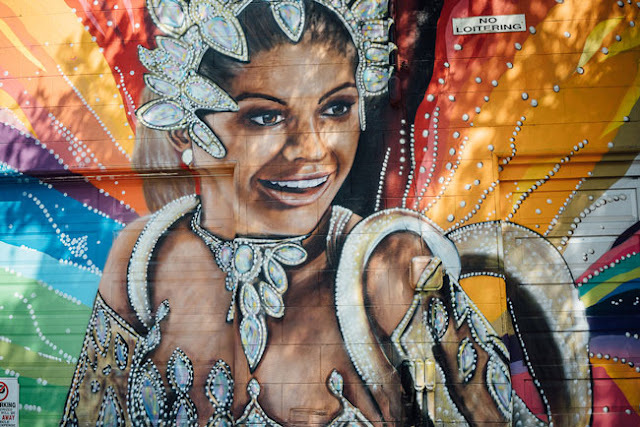 Perhaps the most famous “alley”/lane for murals in San Francisco is Clarion Alley in the Mission located on Valencia street, the highly gentrified stretch in the neighborhood. 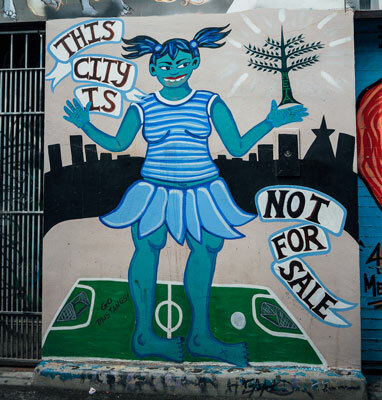 Walking down Valencia street, you will be greeted with a beautiful blue mural on Cunningham and Valencia (Mural 1) and another patch of murals partially covered by parked cars at Sycamore and Valencia (Mural 2), just before you hit Clarion Alley. 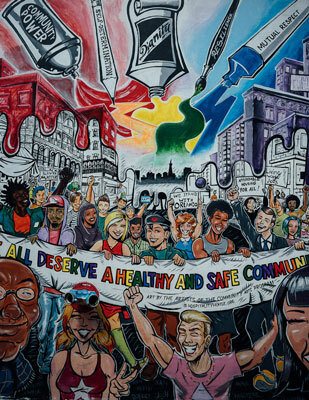 Clarion Alley (Murals 3-13) can be pretty overwhelming, with eye catching colors, themes and elaborate murals screaming for you attention on both sides. 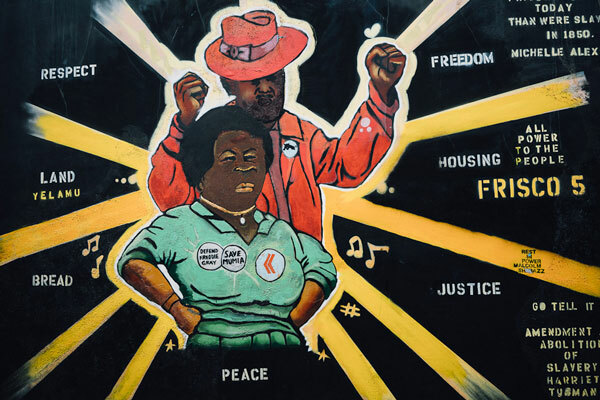 The more important part is the message that these murals convey, which is a demand for social, economic and racial justice and a sombre reminder of the turbulent times the world, especially USA is facing. 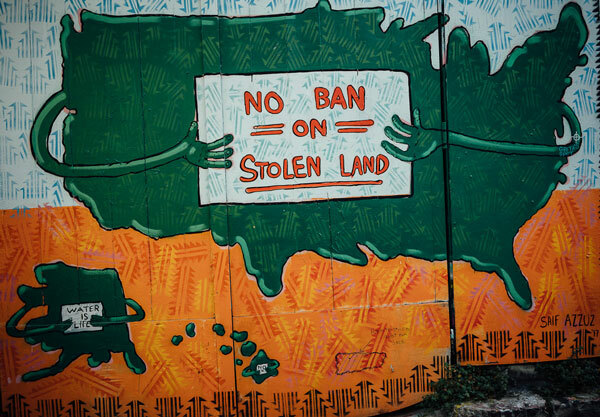 Being an extremely progressive and liberal city, the present set of murals are a tongue-in-cheek to blatant acts of protest against the current administration’s divisive policies. 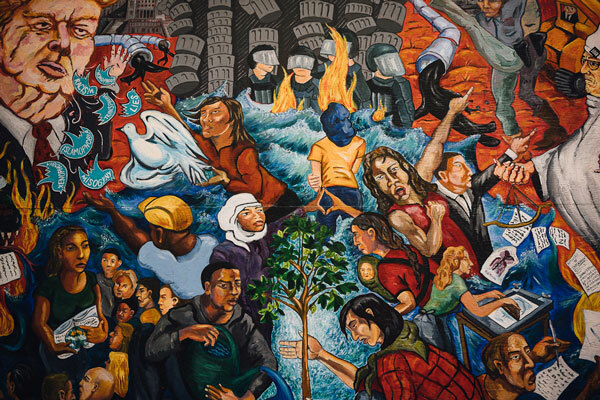 Additionally, you will see murals against racial injustice (rampant killing of African Americans) as well as those calling your attention to the white-washing and gentrification of San Francisco where skyrocketing rents (highest in the nation) and no-fault evictions are pushing people out and destroying San Francisco’s community that was proudly based on diversity. 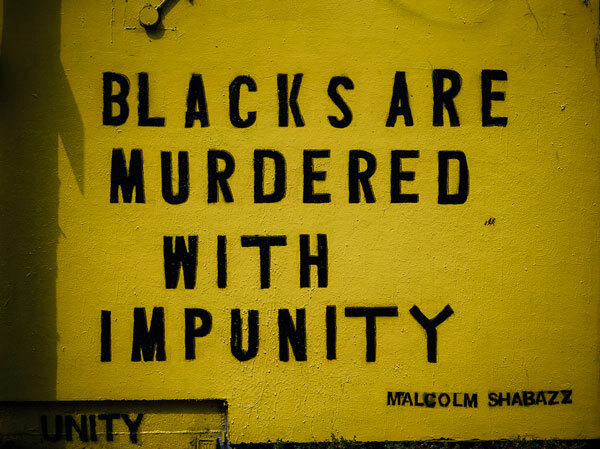 As a long time resident of this beautiful city and someone who has witnessed the horrors of gentrification first hand, I find it ironic that this alley is located on the very street which embodies the evils that the murals are fighting against. 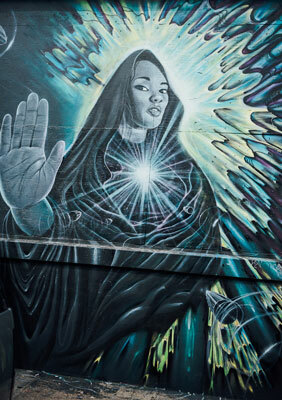 The Mission has borne the worst brunt of gentrification, with many lower middle class families (mostly Latinos) being evicted in favor of shiny condos and an invasion of high-paid young techies from Silicon valley and so these murals are extremely personal for many artists speaking for their rapidly dwindling community. 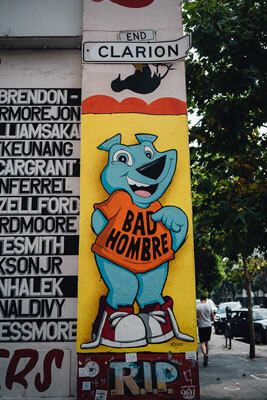 Murals here are drawn by the Mission Artists community and Sirron Norris (Bad Hombre Bear), another famous local muralist. Most people stop their mural tour at Clarion alley, being completely oblivious of another treasure trove of murals that awaits them in other parts of the Mission, specially the 24th street corridor. 24th Street on Mission has somehow managed to resist this gentrification and truly reveals the life and culture of San Francisco’s Latino population. 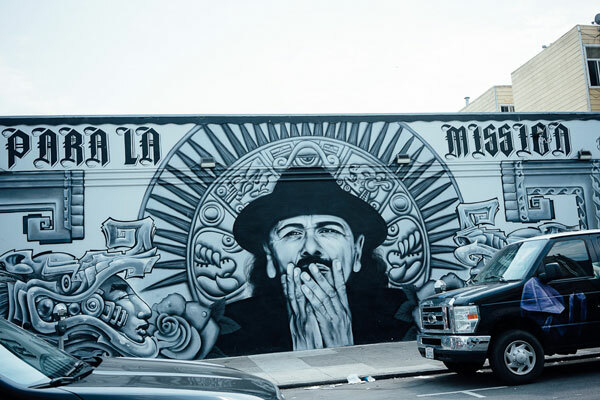 Stop by the Mission and 19th street mural of the famous guitarist Santana (Mural 14) and then start your way down 24th street from the BART station to discover one amazing mural after the other. These murals (Murals 16-21, 23) shown here were clicked along 24th street between Mission and Harrison (including Capp street parking lot), but there are several more along 23rd street as well (Mural 22). 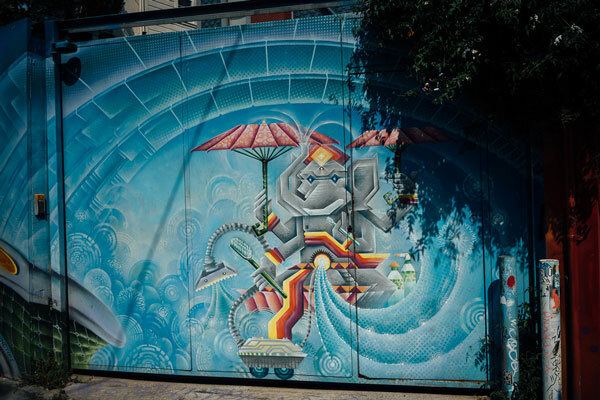 Special mention goes to Cypress street on 24th street which also has an impressive collection of street art, such as this Blue Ganesha (Mural 17). 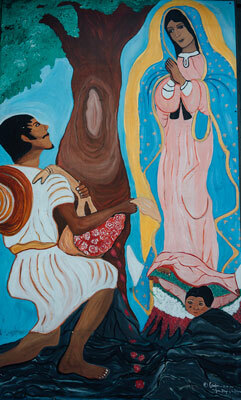 The mural themes can broadly be divided into religious (Our Lady of Guadalupe makes several appearances), political/social (such as immigration and race) as well as cultural (such as homage to Latino roots such as Aztec symbolism and Mexican folklore). 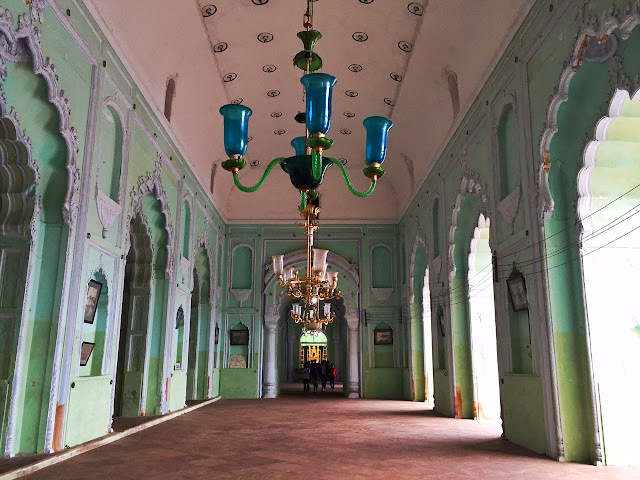 Of course, exploring these gems would be much easier with a map, and here is one precisely for that! 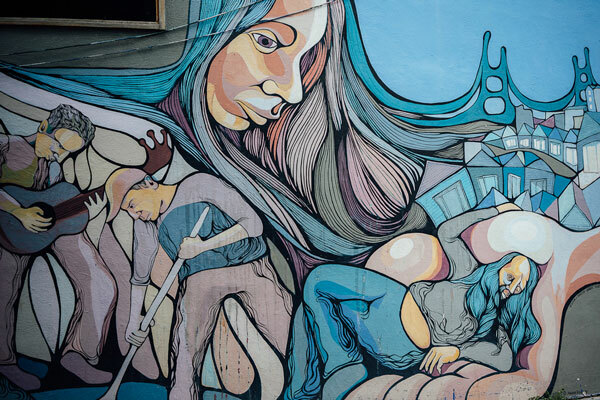 Finally, here are a few suggestions for re-energizing yourself in the Mission before you embark on this intense mural hunt. 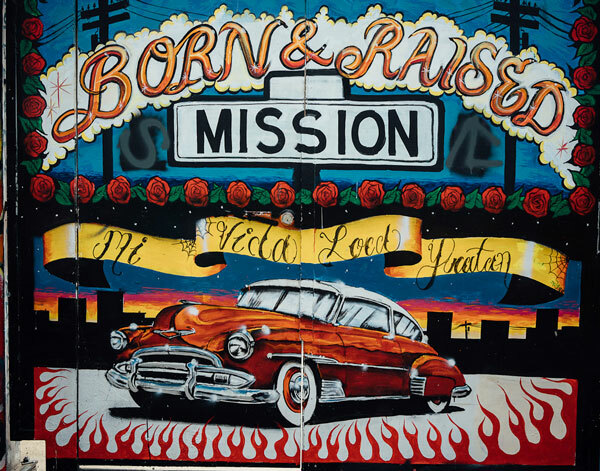 The Mission has hundreds of places to grab a bite and here are some of my favorite spots. Tortas Los Picudos is one of the best kept secret of Mission, this mom and pop store on 24th street makes killer sandwiches (tortas) and has a great selection of freshly made juices. Dandelion chocolates is a 100% local, bean to bar cafe has amazing drinking chocolate and is on Valencia street. Do not miss their Mission inspired spicy chocolate drink. 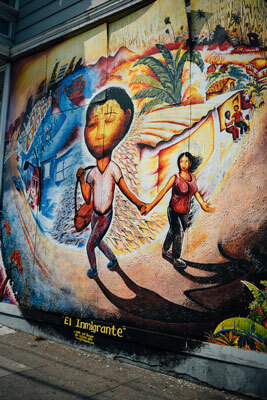 La Taqueria is located on Mission street, a block away from the 24th street BART, their Mission style burritos (wraps) were voted the best in the country. Worth standing in that long line. 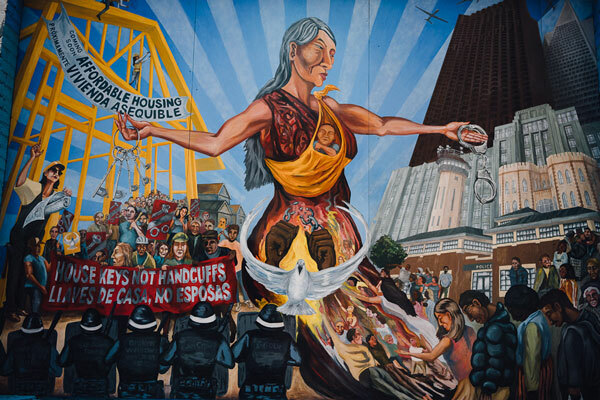 I hope you enjoyed reading this virtual tour of San Francisco murals. For more off-kilter activities as well as rare local insight into San Francisco, you can visit my website: Year of the Monkey. Paroma Chakravarty is a scientist by profession and a blogger by hobby, living it up in beautiful San Francisco, California with her husband and pup. 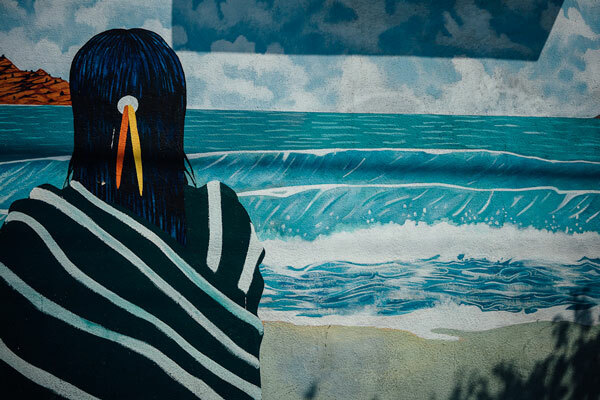 She moved to USA in 2002 to pursue higher education and spend an inordinate amount of time in the lab in her grad school years with minimal travel. She is trying to make up for that lost time and thus tries to explore as much as she can with her camera. 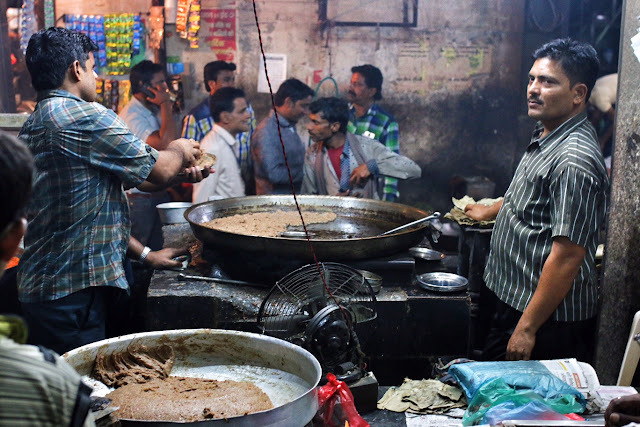 When not working, Paroma loves to try new cuisines, dabble in new photography gear or go hiking with her dog. If you also have a story to share and would like it to be published here, please read more: Submit guest post. Amazing art works. Thanks for the beautiful post. I love this form of art. Thank you for sharing, definitely adding it to my Travel List. This place was amazing! Great food, it's smaller than others I guess but it is still a fair sized fun. The decor at this venue was amazing as every note of music reverberates off the beautiful walls. Everything about San Francisco event venues is nothing less than 5 stars.